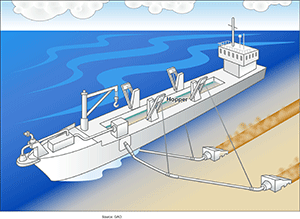 This diagram shows a suction hopper dredger, which works by sucking a mixture of dredged material and water from the seabed through a suction pipe and depositing dredged materials in an onboard hopper. Image credit: United States Government Accountability Office (GAO). Dredging is an excavation activity that involves removing materials from the seafloor, lake bottoms, riverbeds, harbors, and other water bodies. The depth of navigation channels and harbors needs to be maintained over time or in some cases increased if larger ships use the area. Other purposes for dredging include flood and storm protection, extraction of mineral resources, fishing for benthic animals, and removal of contaminated sediments. A variety of techniques are used for dredging. Mechanical dredging involves the use of a crane-operated grab or bucket to remove seabed materials. Hydraulic (suction) dredging works by sucking a mixture of dredged material and water from the seabed through a suction pipe that may or may not have a tool at its end (“drag head”) to disturb and/or break up bottom materials. The photograph shows the U.S. Army Corp of Engineers’ hopper dredge, Currituck, pumping dredged material into its hopper. Image credit: Hank Heusinkveld, USACE). 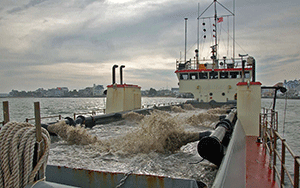 Underwater measurements of noise generated by dredging vessels are limited. The main processes that contribute to noise associated with dredging are collection noise, pump noise, transport noise (material being lifted from the seafloor to the dredger), deposition noise (placing material within a barge or hopper), and ship/machinery noise from the dredging vessel itself. In general, dredging produces continuous, broadband sound concentrated at or below 1 kHz. Sound pressure levels can vary widely depending on dredger type, operational stage, or environmental conditions. Noise levels also depend on the materials being extracted, with harder sediment extraction generating higher noise levels than loose or soft sediment extraction. Estimated source levels for dredging range between 168 and 186 underwater dB at 1 m.
Thomsen, F., McCully, S., Wood, D., Pace, F., & White, P. (2009). A generic investigation into noise profiles of marine dredging in relation to the acoustic sensitivity of the marine fauna in UK waters with particular emphasis on aggregate dredging: phase 1 scoping and review of key issue (No. Cegas MEPF Ref No. MEPF8/P21) (p. 59). Marine Aggregate Levy Sustainability Fund. US Army Corps of Engineers, About Dredging. Robinson, S. P., Theobald, P. D., Hayman, G., Wang, L.-S., Lepper, P. A., Humphrey, V., & Mumford, S. (2011). Measurement of underwater noise arising from marine aggregate dredging operations (No. MEPF Ref No: MepF 09/p108) (p. 146). Marine Aggregate Levy Sustainability Fund. NOAA, National Ocean Service., What is dredging?